I love the PlayStation Vita. I’m not sure if it’s the overall beauty of the handheld or what, but I just can’t put it down. It’s not often that a handheld launches with both a stellar launch lineup and an exceptional catalog of older games ready to be played, but that’s exactly what the Vita has, and that may be its strongest suit right now. There’s well over 300 PSP games available on PSN right now that are compatible with the Vita. There have been other consoles that have launched with a large catalog of backward compatible titles, but never have they been so immediately available as they are with the Vita. A simple download and you can have almost any PSP title available on your Vita, that’s something that hasn’t really been done before. Sony has done a good job of giving players the option for an all-digital future by making most Vita games available as either downloadable or physical content. It isn’t something that happens often outside of the PlayStation Network; offering downloadable and physical copies of a game simultaneously has only been done a handful of times on the Microsoft Xbox 360 outside of their Games On Demand service (which is actually making big strides, but doesn’t compete with the PlayStation Network's often same-day delivery). As for Nintendo, well, they would need to discover the Internet for that sort of digital/physical delivery system to work with the Wii or 3DS consoles. This thought sparked as I took a look at the PlayStation Store this weekend. I (metaphorically) strolled into the PSP section and discovered that I had purchased a bunch of titles on my PSP a few years back. I didn’t need to go through the trouble of finding my PSP to play them; I simply hit download and I could play my games in minutes. I downloaded Persona 3 Portable and booted it up. I was curious to see how the Vita's emulation software worked; was it just a straight PSP emulator, or could it take advantage of the Vita's new components? The answer was both. 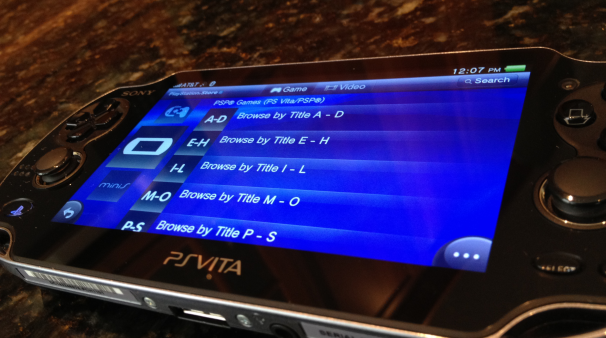 It was just a PSP emulator, offering the same save system and button configuration, but there was also a set of options that allowed the game to take advantage of the second analog stick, front-facing camera, and other Vita features. Configuring the PSP emulator was as simple as choosing which PSP buttons to map to the Vita’s secondary analog stick movements. It didn’t make much sense in the context of Persona 3, but it sure will make it easier to go back to all the early PSP shooters that mapped aim movement to the face buttons. For as much flak as Sony gets for being “secondary" to Xbox Live, they sure are taking a chance on innovating digital distribution systems that we have in place right now. It wasn’t strictly necessary to build a PSP emulator that takes advantage of the Vita’s powerful hardware, but Sony did it anyway and the future of last-gen gaming is better for it. I may not be ready for an all-digital future, but this certainly has me looking more fondly on the prospect.